This year, the buzz all around us is about planting for pollinators. Many of our native bees as well as honeybees are declining in numbers; some may have already become extinct. This is due to many factors including pesticide use, loss of habitat, the fragmentation of habitats into little patches, and much more. You will find on our seed racks all kinds of seeds that bees love. Cosmos is an annual that is just so simple to grow. I plant mine directly in the ground mid-late May. We also sell seedlings and larger, established plants once the weather warms up. Once you have planted cosmos, watch for it to self-sow. Zinnias are also wonderful pollinator plants. 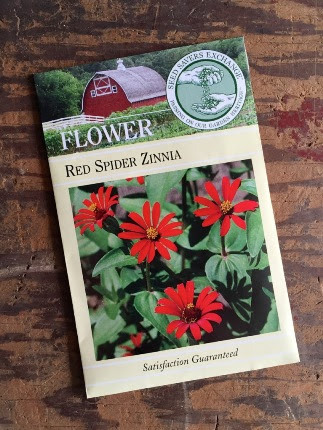 Many of the zinnia seeds we sell are heirloom varieties, such as this red spider zinnia from Seed Saver’s Exchange. We also stock some great blends; some are bright, carnival colors, others are striped, others are soft pastels. Zinnias should only be planted when the soil has warmed up. 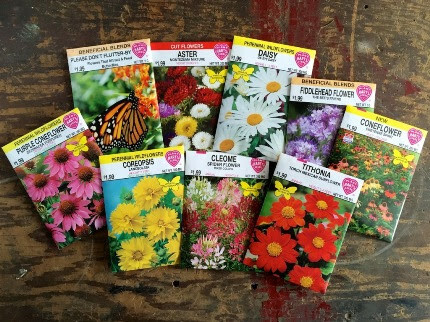 If you want the greatest selection for your pollinator garden, buy the seed and sow it directly or start it indoors in early April. Bees are attracted to all of the single daisies including Echinaceas, asters, and Coreopsis. Shown in the photo on the left is fiddlehead flower (Phacelia) which is also known as “bee’s friend”. This is a billowing, loose, airy annual that can fill in between your more upright flowers. The most important factor in planting for pollinators is to be sure that you have large blocks of the same flower (we often refer to them as groupings or drifts in design language) and to have something in bloom from very early spring until very late fall. With the erratic weather patterns that we are now experiencing, I was glad to have early bulbs and witch hazel blossoms in bloom this week- my bees were out and foraging! Succession of bloom is our specialty here at Natureworks. We can help you plan your garden so the pollinators are happy and stick around, thus insuring your edible crops are pollinated as well. Did I mention that most of the pollinator plants are also important nectar sources for butterflies? And many of them also provide nectar to beneficial insects, the good bugs that control the bad bugs in our landscapes.